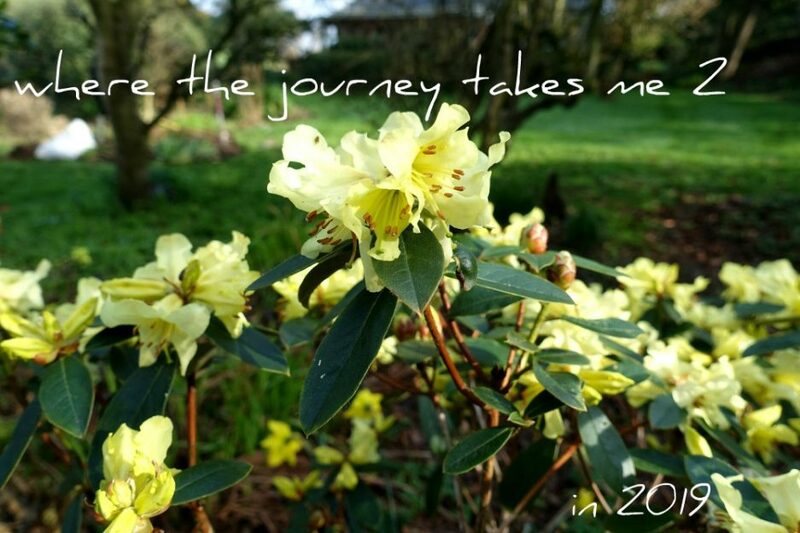 It is 7 years today since I did my first blog post in 2012 on my previous blog ‘where the journey takes me’ – I have had a wonderful time, gained many new blog friends and read a lot of interesting ideas – it has been an exciting journey so far and long may it continue. A big thank you to all those who have journeyed along with me – your company has been much appreciated as have your comments. I would love to hear from anyone who reads but doesn’t normally comment – just a quick hello would be great. It fits well with my present circumstances since I am no longer in paid work, probably retired but maybe not just yet – everything in abeyance. Transition – the process of changing, or a change from one form or condition to another: from transire ‘go across’. This just about sums up where I am at the moment – a leap into the unknown! Lots of alterations and adjustments to make and with any luck a complete transformation by the end of 2019. We have friends coming tomorrow evening so I need to make the house presentable – I have been working on it most of the week. The Christmas decorations are down, the windows have been flung open to let the fresh air of the New Year in and even the duvet spent the morning outside on the line to freshen up before putting on clean bed linen. My positivity at the moment is encouraging and I am ready to begin. Presently I am still at the planning stage and January is the ideal month for this. As we have plenty of major projects either on the go or on the master list that need to be co-ordinated it will be a question of fitting everything in. Some of the top priorities are the decorating, installing a new kitchen and completing a few outside jobs once the weather is on the turn. Added to which we need to sort the cottage out it has been a dormant project too long now. And on the domestic front I need a new spending and saving plan, an exercise regime and of course lots of healthy eating wouldn’t go amiss…and when I have time a bit of crafting, reading and relaxing. As my blog was always intended as a diary for myself to look back on my starting point for this year will be to review and reflect on last year and see what worked and what didn’t. Did my focus word of the ‘Power of small’ work for me?….all will be revealed. Hi Jenny – lovely to hear from you – anyone who has been reading for the whole 7 years would deserve a medal!! I retired very early when I was 47. I was lucky enough to be able to pack in a job I was no longer enjoying and was causing me considerable stress. I am now 65 and looking back it seems to me that I took maybe 5 or even 6 years to settle into retirement. I took up new hobbies, made new friends, moved home and was able to devote quite a bit of time to help with grandchildren as they came along. I didn’t formulate a definite plan which maybe was a mistake but I didn’t drift either. I think transition just about describes the period well. Good luck with your plans for 2019. Hi Catherine – I do worry about drifting but on the other hand I also worry about over planning my time – like anything else it is about the balance. As I am Thyroxine dependant to live anyway I fully understand the implications of being well balanced or not – if my medication is too much or too little it really throws me off kilter and either I am hypo or hyper like a diabetic. I need to get as good balancing my life as I am with my medication! Hi I love reading you but don’t comment .congratulations on seven years. I enjoy your trips around Yorkshire as I lived there for many years. Hi there and how lovely to hear from someone of the same name! Yorkshire is a large and beautiful county and it would be hard not to pass through it on the way up North or down South or even across country. There are still paces I haven’t been to and must make the time to go. As I come from Sheffield in South Yorkshire I do tend to go into Derbyshire for a day out as it is where I spent a lot of my early childhood and also a lot of time with my two girls as they were growing up. All the best for 2019. Happy ‘blogday’ and Happy New Year. I’ve been a reader for a little while now and really enjoy your blog. Thank you for sharing with us. I retired from full-time work after 33 years at a public library and now look after my 4 year-old grandson full-time. To say life has changed radically is an understatement and I’m still wrestling with how it will all flow. Happy New Year Lynne. I am amazed at the length of time some of my readers have spent at work and in one place. Some of my former younger colleagues just come and go quickly now and probably the reason it seemed very unsettled a lot of the time. Enjoy the time with your grandson – that is quite a commitment to take on but a lovely one though I expect you are tired at the end of the week – our granddaughter can be a bit of a whirlwind – so much energy to burn. Happy Blogday! I read but rarely comment which I’m sure is infuriating for bloggers who probably feel like they’re talking to themselves. I’m interested in some of the same things as you eg sustainability, working out how not to waste money, vegetarianism, crafting and reading etc etc so keep up the good work. Even if you don’t always hear from us, we’re out here! Hi Wendy and thank you for your comment and for reading. I am always surprised that people do read my blog as I started it more for myself as a journal but it is also nice to have a little chat with people via the comments along the way. Congratulations Viv on your blog birthday and every good wish for a healthy and inspirational 2019. I will watch your transition with great interest! I am not sure I will be a caterpillar changing into a beautiful butterfly exactly but it seems to be a word that fits my moment in time. Happy New Year and Happy Blogiversary! I like the word abeyance – it will be interesting to see, in time, what it is replaced with. Are you really having a new kitchen installed this year – what a big job! If you want to share, I would be interested to know what the complete “to do” list is for the cottage. We have been having a new kitchen since 2008 and have had one on order a couple of times that we then had to cancel for various reasons one of which was my cancer diagnosis and subsequent treatment. Each time we even mention the word new kitchen or even the word decorate in this house someone falls ill, or needs help with moving, or there is a major crisis (like the flood) or as we are experiencing now someone is expecting a baby and needs help to decorate their home! Meanwhile our home gets pushed back down the list again!! It must be your blog anniversary too, is it not around this time – I feel we have been on the journey together for a similar length of time? Yes, you have been my blog companion all this time – I started mine at the end of December, 2011. Congratulations on your seventh blogaversary!